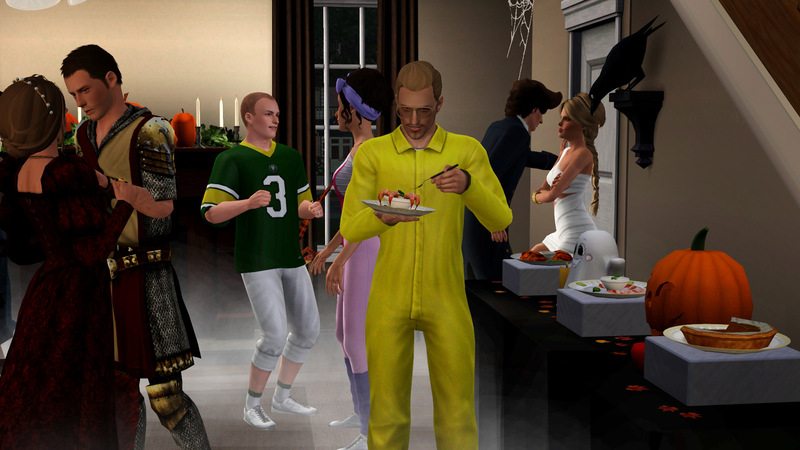 I don't know about y'all but my sims are pretty darn tired of autumn salad, stuffed turkey, and cookies at those buffet tables. And though I might not have kids yet, I know enough about them to know serving that kind of food at a kid's birthday party might lead to the holy grail of meltdown temper tantrums. 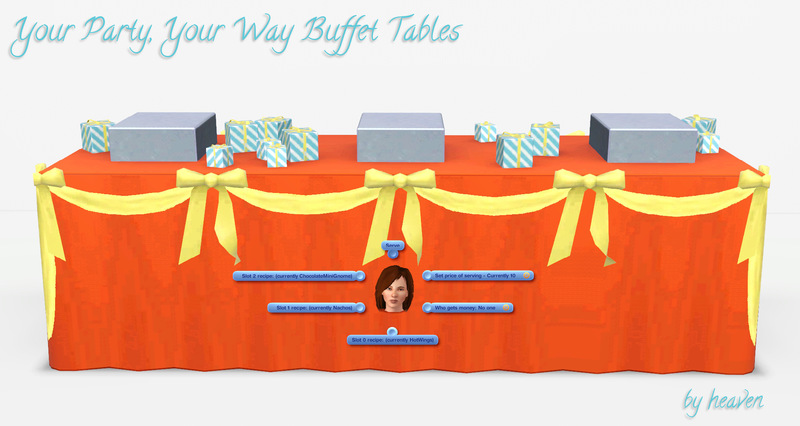 Icarus_allsorts has a fabulous Resort Buffet Table mod that allows players to choose the meals served within the resort and also use on community lots. But what about parties on home lots? Or themed parties? 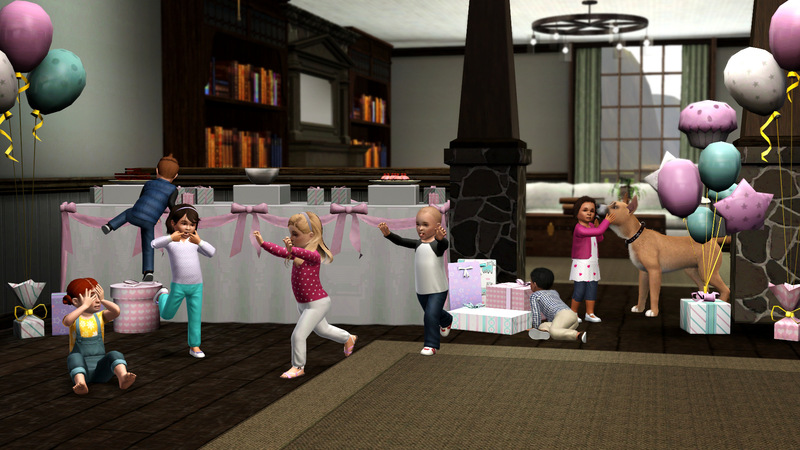 Turns out, IngeJones has a pay buffet mod for players wanting to run a home business. 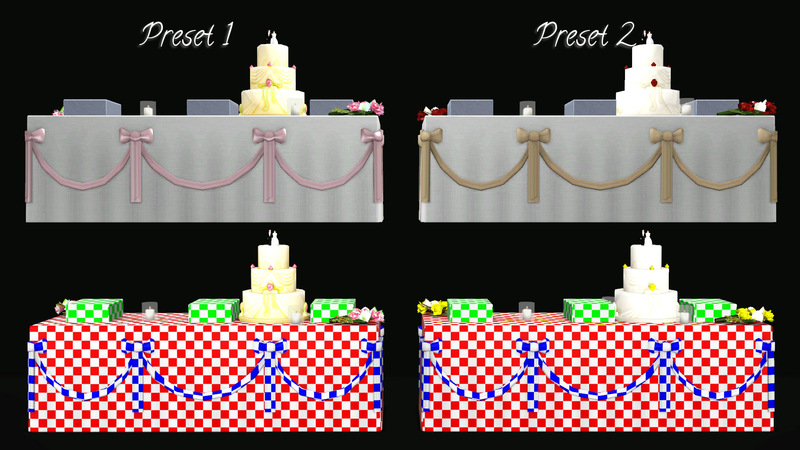 With her permission, I poked at her mod and got it working with the store buffet tables as well. While I was at it, I also played with the channels to make the best use of them and, in some cases, get a bit more functionality out of the tables. 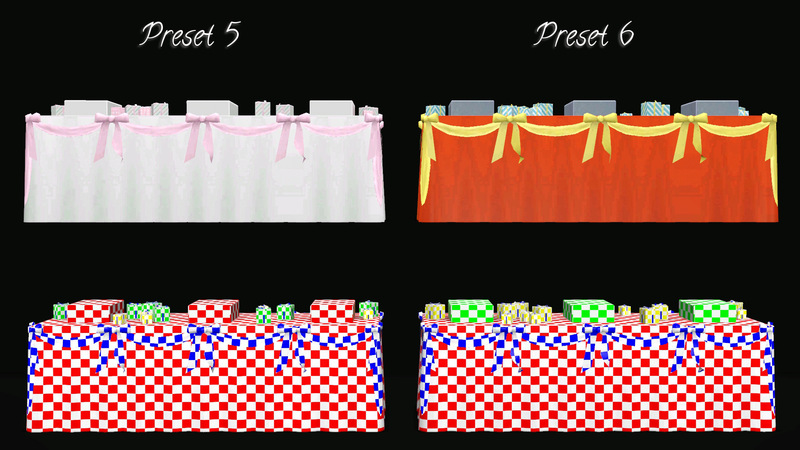 This mod brings up an extended pie menu for the buffet tables. 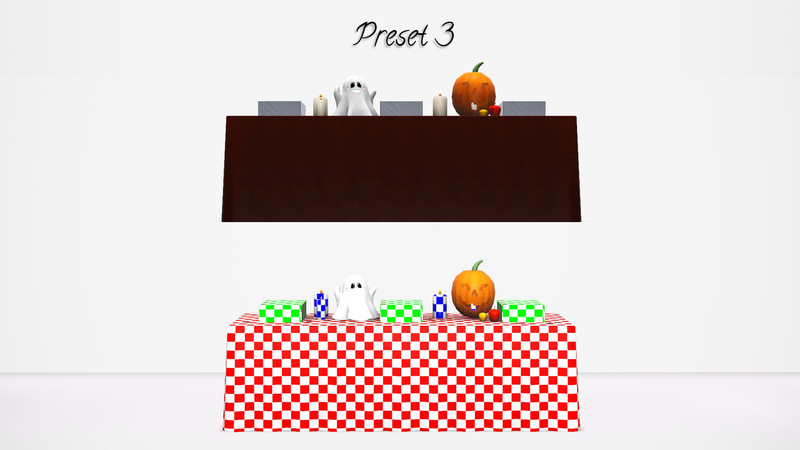 When you click on the table, instead of only getting an option to "Serve", players can now choose which meal will be served in each slot. 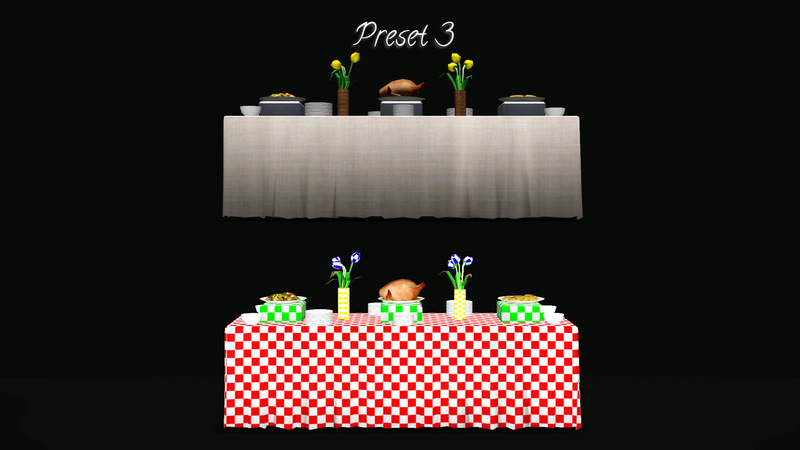 Players can also choose to charge sims for the food. Any meal that has the "group serving" code can be chosen. This includes bar food like shrimp cocktail and nachos. When placed on a residential lot, the active family for that lot receives payment. On all other lots, the person who served receives payment. They must be on the same lot as the buffet. If you set a price, there is a possibility some sims will consider it too expensive. Price can be set to §0 if you do not wish to charge your guests. *Store premium content that adds recipes: Sizzle Baby Pro Deep Fryer, Chun Co. Teppanyaki Grill, Wood Fire Oven, and the Baker's Station. **Due to the way EA coded the recipes, the meals from the Baker's Station show up under Vegetarian or Meat, rather than desserts. I assume they had some reason for doing it this way, other than just being EA. Basically, if you want to serve apple cobbler, don't expect to find it under the desserts! Velocitygrass's mod was a great help to me before I undertook this project. However, it could only go so far in making these items as versatile as they could be. It can still be useful, particularly for the winter buffet (see below in the channel breakdown) so I would definitely recommend it. However, I still wanted to adjust the masks to make better use of the channels. 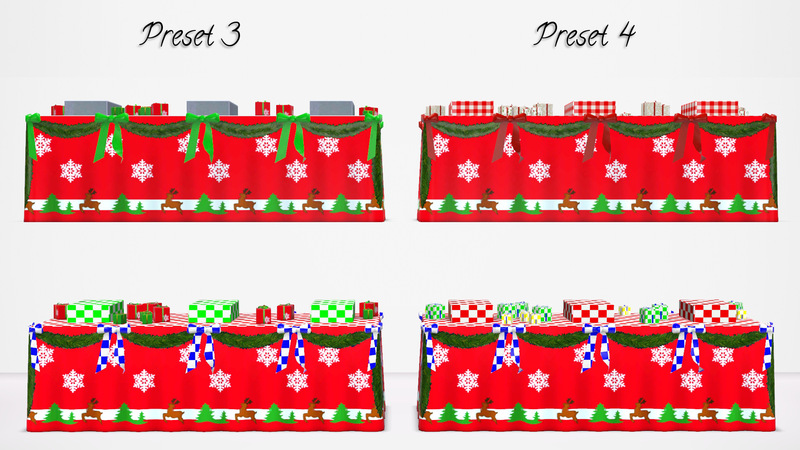 To me, the most exciting one I worked on is the Holiday Winter buffet table. 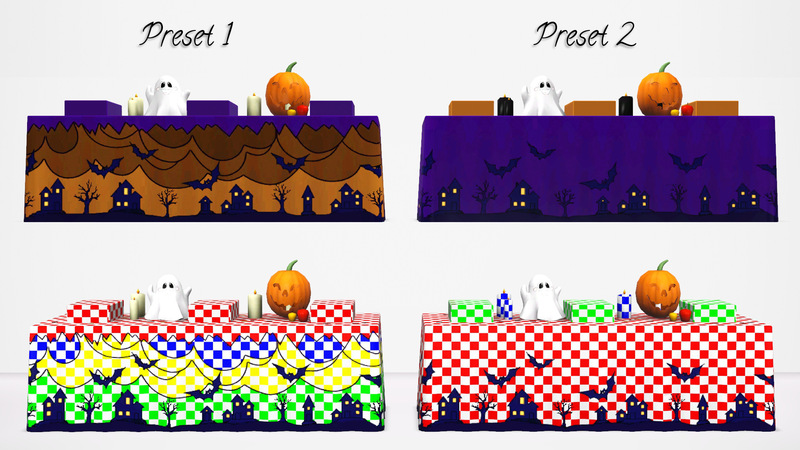 Before, it had only 2 presets: both came with predesigned tablecloth, garland, and presents. I saw greater potential for it though so, with some adjustments and the help of TextureTweaker, it can now be used in all manner of gift giving parties: Christmas, birthdays, baby showers, etc. *Due to the way EA mapped things, there are some stretched sections on the vase that I couldn't fix. It's not very noticeable since the tiling is small unless you zoom very close in. **Preset 2 and Preset 3 are only different because on the 3rd I got rid of the dog kibble in the bowls. I don't know what it was supposed to be but I didn't like it. 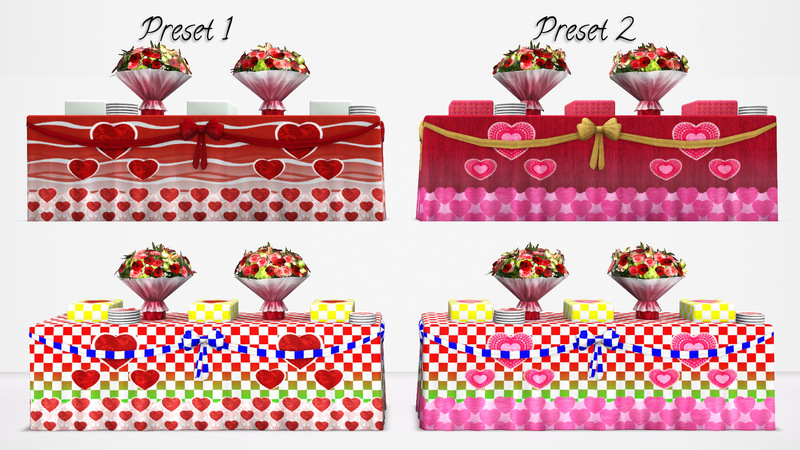 *If you have my previous buffet table, this one is better, both in channels and because of the added script. 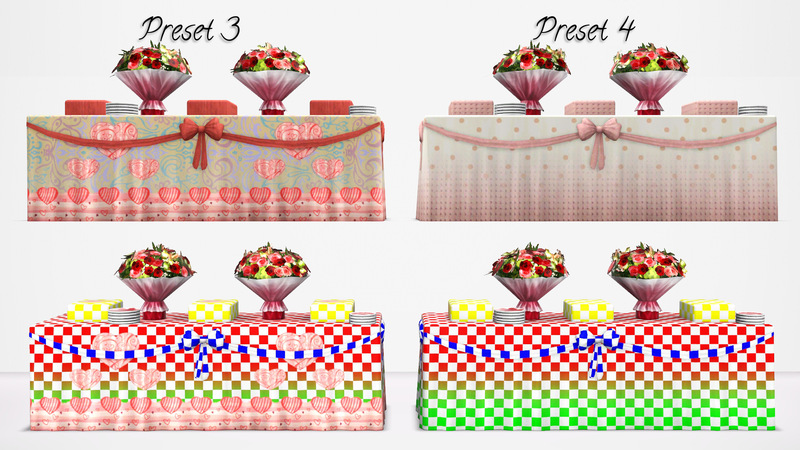 *Using velocitygrass's mod, you can get an additional 2 designs from Presets 2&4: use the cheat to remove only the stencil and you will have a fully recolorable tablecloth and presents but still have the garland overlay intact. 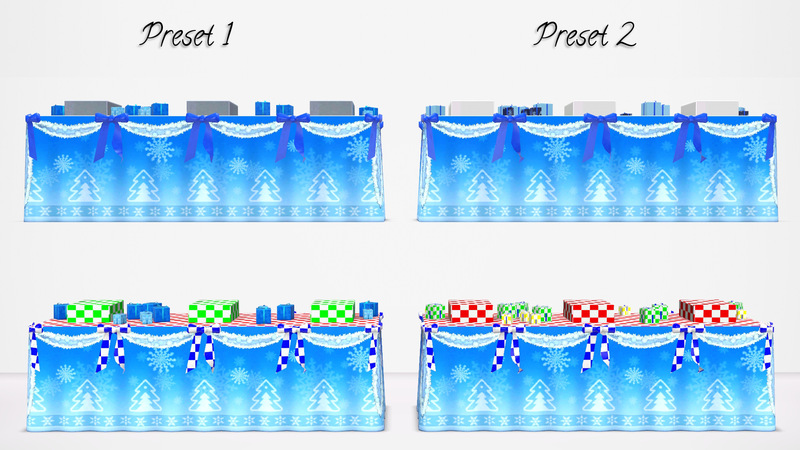 heaven_BuffetTable_DefaultReplacements: will replace EA's version of the buffet tables and will conflict with any other mods that alter the same OBJD instances (listed below). 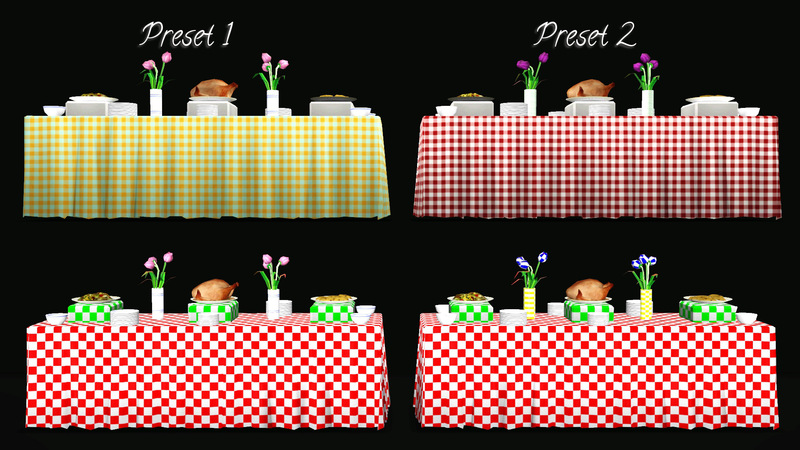 heaven_BuffetTables: Stand-alone versions in case you do not want default replacements. You can have either or both (though both would be really silly). Should be compatible with 1.67 as well. I am unsure about earlier patches. IngeJones, most importantly, for making the original buffet script and giving me permission to work with it. Buckley, for doing additional testing for me. 625 people have said thanks to heaven for this download.